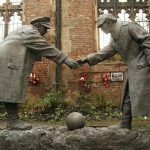 In remembrance of Armistice Day, the North Wilts Youth Football League would like all clubs involved in League, Cup and Development matches to observe a one minute’s silence before all fixtures on 11 November. The silence will commence and cease on the referee’s whistle. As in previous years, we encourage teams to send in photos of players paying their respects to admin@nwyfl.co.uk. A selection of photos will be posted onto the NWYFL website – if you do not wish (or do not have players’ permission for) photos to be posted, please state so clearly in the email subject.